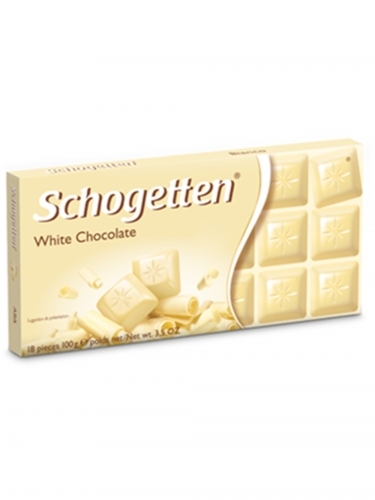 White chocolate is not a chocolate in a strict sense as it does not contain cocoa solids. Its main ingredients are Cocoa butter, sugar and milk solids and are characterized by yellow or ivory appearance. There are still some people who don’t like dark and milk chocolates. For them, Schogetten, a German brand came up with this chocolate to provide them a chocolate that isn’t a chocolate in real sense. Some parents are even afraid of excess chocolate consumption by their children as it generally spoils teeth. White chocolate is its perfect solution as it will satisfy the kids without any complaints. You can even share this chocolate with your loved and dear ones who don’t adore chocolate much. With www.foodfeasta.com you can comfortably order this delicious chocolate and see its magic. We are there to deliver it right at your home. Ingredients Sugar - Cocoa butter - Skimmed milk powder - Whole milk powder - Cream powder - Sweet whey powder - Lactose - Butterfat - Emulsifier (soya lecithins) - Natural vanilla flavour.